In preparing to sell our house, we had to have some pictures taken. I don’t think I have told my sons “Just go sit down and don’t touch ANYTHING!” more often than I did in the last two days. Because I enjoyed seeing where Alison wrote her posts, I thought you might want to see where I write mine. 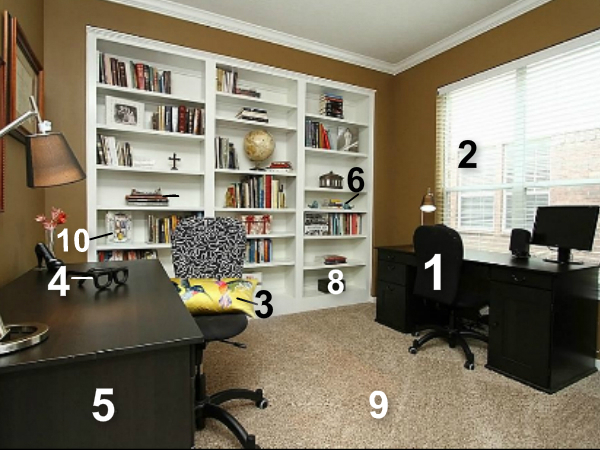 DISCLAIMER: Before we got the house ready to sell, I PROMISE you that the study didn’t look ANYTHING like this picture right now. My desk was COVERED with books, papers, pictures and greeting cards I forgot to give out, as was my husband’s. For many months, there were boxes and books all over the floor, as we sometimes used this as a room to stash things. A little girl down the street used to come by and say, “Is your study clean yet?” because it never would be when she visited and I’d always tell her, “It’ll be clean the NEXT time you come over.” It usually wasn’t. She’d let me know, too. #1: My husband’s desk. THIS is where I write my posts most of the time. It’s really my desk, too. And the boys’ desk. I like to use it because I’m too lazy to get out the laptop. Normally, my husband’s desk is covered in papers and crumbs from the boys’ snacks they’re not supposed to eat in there. They’re not supposed to drink in there, either, but ONE day, a cup was found on the desk. This made my husband grumpy. Maybe you remember the practical joke I played on him? #2: The window. Sometimes when I am sitting in my husband’s chair, I look like a yak’s armpit. My neighbors always seem to want to mow their yard when I am looking very, very yak-like. They’ll just mow and mow and mow on that little strip of grass in between our houses like it’s the dang Amazon and I never know if I should wave or pretend I’m really engrossed in the screen. #3: My hummingbird pillow. I bought this pillow at west elm after my mother said, “Kelley, you don’t need that pillow. Where are you going to put that pillow? Does that even go with anything in your house?” I think those questions made me want that pillow even more, so I bought it and stuck it there. So bratty of me. #4: Extra huge wrought iron glasses. I bought these glasses at Pottery Barn. It was another bratty purchase. When I am shopping, which is very rare because I don’t like shopping (see Home Depot), a very, very small version of my husband sits on my right shoulder and says things like, “Kelley, you don’t need that. You are going to pay that for some big glasses? It’ll just collect dust!” It turns out he never said anything about them. Yet. #5: IKEA These desks are from IKEA. I saw an article via Twitter recently about how IKEA desks are the “wood-based equivalent of mystery meat”. #6: Bluebirds The realtor said I needed to clear all personal pictures and all of the paperbacks from the shelves to leave more open space. So, there went all of my old Babysitter’s Club, Sweet Valley High and Ramona Quimby books. Boo. Given all of the empty space, I had to find something to fill it up. Hence, the bluebirds. I bought them two days ago at a store where my 4-year-old kept trying to smell all the candles. He’s a smellaholic. He buries his face in each and every one, “Smell dis one, Mommy. Dat smells dood, right, Mom?”. He almost broke one, which caused me to contort my face in a most unattractive way AND caused the owner to descend upon us like a Edward Cullen, except she was an old woman. I miss you, paperbacks. The birds aren’t as fun to read. #7: There is no “7” because I don’t know how to count. #8: Photo Albums All the photo albums that I didn’t keep up with used to be there. I feel more free now since they’re not staring at me, but now that I’ve brought the blasted things up, I’m hyperventilating. I’m typing and hyperventilating simultaneously. I am a pretty good multi-tasker, I must admit. #9: THE LINES!!!!! The floors have GOT to have those lines when people come to look at the house. The house could have rhinos sitting in the bathtub and chimpanzees hanging out in the pantry but STILL sell if there are good lines in the carpet. I am hoping that is true, anyway. It doesn’t look like I am going to get those rhinos out of the bathtub any time soon. Dang it. One just pooped on the carpet. I’d love to see where you write! Wanna share a picture? Take one and send it to me at kelleysbreakroom@gmail.com. I will feature them in an upcoming post! In addition to writing this post at that desk, I also wrote “Top 9 Reasons We Should Be Glad We’re Not Moms in the 1980s”, which is being featured over at NickMom this week. You can find it by clicking here. Thanks! Link up new funny stuff. Link up old funny stuff. It will show up here and over at Anna‘s place. Kim at The Fordeville Diaries is sharing her FIVE favorite posts from last week’s party (and maybe a few honorable mentions). Visit The Fordeville Diaries to see if you were one of Kim’s favorites!